This unisex drawstring backpack is the perfect item and size for all your needs. MEASUREMENTS:12"W x 15.5"H. With sturdy adjustable straps for carrying comfortably (just re-tie the knot further along the string to adjust and shorten). Take it anywhere you go! It will be your new favorite backpack, gym bag, beach bag, sports bag, school bag. It offers a lot of convenience when storing things like clothing, shoes, sporting equipment, daily essentials or other stuff. Just start thinking of all the places you can use this versatile bag! Hiking, biking, beach, traveling, festivals, concerts, sleepovers, parties, school, sports, gym, streetball, shopping, camping. No limits! Take it where ever you want. Has a simple and stylish design. Just linen with finest quality finishing. The heavy duty stitching will last longer without loosening threads and can hold up to 30 pounds of weight. Compared to cotton, linen requires less water to cultivate and is 30% stronger. Great gift idea for him or her, young or old, for any occasion. With the widest range of prints you'll find anywhere, you are sure to find the right design for that special person! 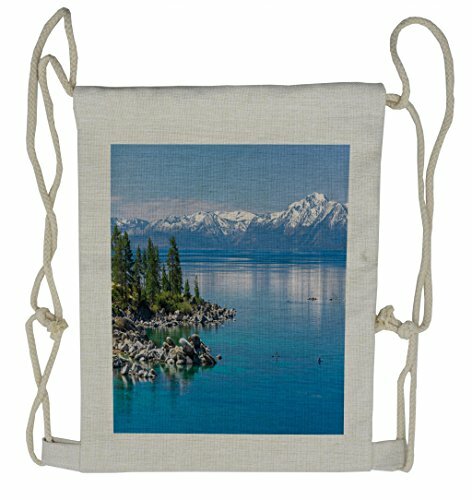 Our backpack designs are professionally printed, so your unique design will look great and make someone smile with the funny, cute, vintage, or expressive artwork. Customized, personalized products are very popular. As manufacturers of digital printed products, we follow current trends and bring you the latest hot fashion products. Either a gift to your family or friend, mother, daughter, son, boyfriend girlfriend, best friend, or to yourself, the item should be interesting and authentic. EASY CARE: machine washable at 40°C (104°F) with light colors, tumble dry at gentle mode, hang to dry, iron damp with steam if necessary. Every wash will make it softer. The image is only printed ON ONE SIDE of the bag. Environmentally friendly, no dye substance harming health of your family. Colors won't fade thanks to new digital printing methods. SIZE: 12"W x 15.5"H. High quality, sturdy, lightweight, unisex cinch bag. Image printed on one side. ECO-FRIENDLY MATERIAL: 100% linen with heavy duty stitching. Long lasting. Holds up to 30 pounds. MULTI-PURPOSE: Gym bag, sports bag, yoga, hiking, school trip, beach, pool & MORE! Fun. Versatile.